Summary: This is a valiant effort by debutante director Mansoor; a veteran writer / director from TV and lyricist. ‘In the Name of God’ is a much touted effort by a Pakistani film-maker trying to put across a balanced point of view of both the West’s perception of Pakistani’s and Islam, as well as the plight of Muslims the world over. In trying to put across the case for liberal Muslims versus fundamentalism, it both delivers and fails on a number of levels. It follows the story of one family with three inter-weaving threads showing very different aspects of Islamic culture, our perceptions, de-mystifying misconceptions and misogynism. It’s tackled here using examples such as mixed relationships; wearing western clothing; music, which according to Muslim hardliners (along with art) is the work of the devil. Siblings Mansoor (Shaan) and Sarmad (Khan) are musicians, care-free sons of very liberal parents. Whilst Mansoor is working towards a music scholarship in the USA, Sarmad finds himself an increasingly disillusioned young man, turning towards his faith for answers. He becomes quite extreme in his beliefs under the wings of radical cleric Sher Shah (Naz) and distances himself from his family after their inability to conform to his increasingly obtuse demands. Simultaneously their UK-based uncle has concerns after his daughter Mary (Ali) starts dating an English ‘Christian’… This despite the fact he is a non-practising Muslim, in a live-in relationship with his white partner – Oh, the irony! He slyly carts her off to Pakistan under the premise of a short holiday, where lo and behold, he abandons her for a forced marriage with her cousin – the ever more radical Sarmad. The film is good in so much it’s fresh, contemporary, polished, very real in terms of the subject-matter it’s handling and very relevant in the current climate. But it falls down in its’ treatment as it tries to satisfy too many view-points. Liberal Muslims (the majority) is effectively the perspective it comes from, but it’s too subtle in undertaking much of a criticism towards fundamental elements. But then the movie has already (expectedly, surely..) gained a fatwa, so maybe they pushed it as far as they could. The characters are well thought out, though not fully developed. At times the characters do fall into cliché, especially the uncle and malevolent cleric whom by the end become mere caricatures. The movie is empathetic towards the plight and perception of Muslims post 9/11, and plaudits should be given for it tackling serious issues such as forced marriages, radicalisation of young Muslims, erroneous interpretations of Islam, tribal intricacies and the ‘war’ between moderates and fundamentalists. But alongside this, this film has many other tags such as the movie to revive cinema in Pakistan; to aid in reforming the image of Muslims in the West; revolutionary (i.e. no more gaudy super-permed villains and size 16 over-caked vamps dancing about in tight almost-bursting outfits…) or alternately – helping to increase the country’s ever-widening cultural schism between liberals and fundamentalists; it’s more about the war inside Pakistan. This is a valiant effort by debutante director Mansoor; a veteran writer / director from TV and lyricist; he makes a commendable first impression. 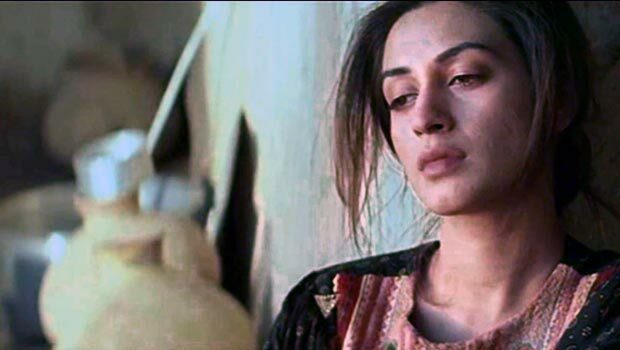 This is thankfully far removed from your typical kitsch Pak-blockbuster; something which has pretty much killed off the Pakistani film / cinema industry. It tackles some significant issues, somewhat succeeding in analysing them although the conclusion left is very much open. The finale has its’ highs and lows, the latter being it leaves you with a slightly discerning outlook. Also, if you can put the subtle digs at India aside, this is well worth a watch. Think Britz with gaudy dialogue, models, murky (agency) yanks and fundamentalists… Not your typical date movie, but it will give you lots to talk about.